is one of the most popular and beautiful species that will produce clumps, as a washing up bowl. It combines clean, glassy white radial spines with hooked reddish-brown centrals. The spines are quite sticking. This plant will produce several complete circles of contrasting light carmine flowers every year. Origin and Habitat: Originally described from eastern Jalisco, Mexico, additional populations have since been located in Aguascalientes just to the north. The area covers around 16 x 10 km. (extent of occurrence =160 km2, one location) . Altitude: 2340 to 2600 metres above sea level. Habitat and Ecology: It occurs in high mountains, in Quercus (oak) forests on steep slopes and grows in leaf-litter and sometimes on inaccesable cliffs together with Mammillaria fuscohamata, Arctostaphylos pungens, Acacia farinosa, Agave filifera, and Opuntia jaliscana. In the past illegal collection was a major threat, however, today this species is widely available from propagation and the pressure in wild populations is minimum. Mammillaria bombycina f. albicentralis hort. Mammillaria bombycina f. flavispina hort. Mammillaria bombycina f. monstruosa green clone hort. Mammillaria bombycina f. monstruosa white clone hort. 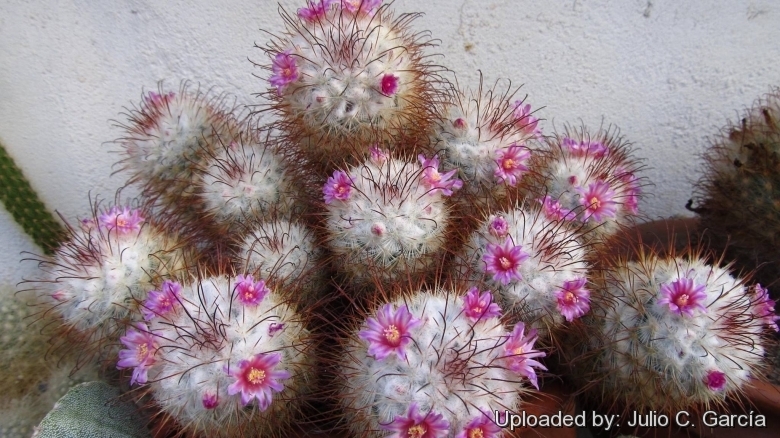 Description: Mammillaria bombycina is a popular solitary or clustering species, some clones cluster aggressively and can form 50-90 cm wide, gorgeous mounds as they matures. Stems: Depressed globose to club shaped, bright-green to grey-green, 7-14 cm high, 5-6 cm in diameter. Tubercles: Conical to cylindrical, firm, latex in tubercules only occasionally. Axil: With dense wool and bristles. Radial spine: 30-65, have a glassy appearance white, to yellowish white stiff, thin, needle-like, pectinately arranged, that almost conceal the epidermis to 8 mm long. Central spine: 3-8 (usually 4), yellow with dark tips, or orange-reddish brown, lowermost one hooked downwards and to 20 mm long, others straight and to 11 mm long. hooked spines. Radial spines: Many, 30-64, stiff, thin, needle-like, pectinated, glassy white to yellowish white, up to 8 mm. Flower: Light carmine, pink or white, funnelform, to 15 mm long and in diameter in circles around the crown of the plant. 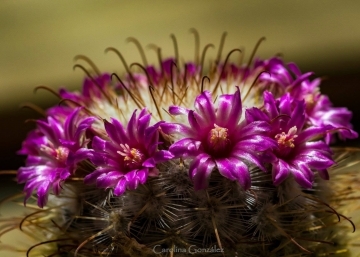 Remarks: Mammillaria bombycina ssp. perezdelarosae is often condidered a good species. 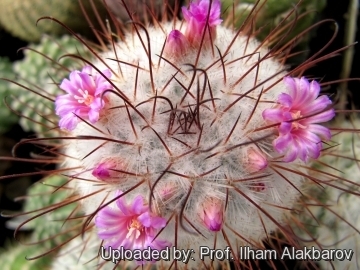 Therefore in this assessment only Mammillaria bombycina is considered. 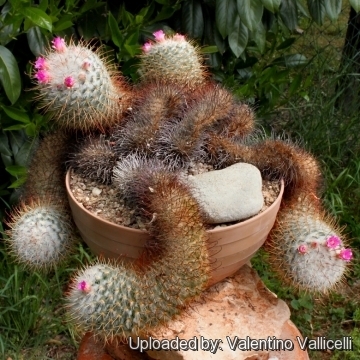 Mammillaria bombycina Quehl: Solitary or clustering cactus, some clones cluster aggressively and can form 50-90 cm wide mounds. It combines clean, glassy white radial spines with hooked reddish-brown centrals.This plant will produce several complete circles of contrasting light carmine flowers. Mammillaria bombycina f. albicentralis hort. : Has evenly white or creamy-white hooked central spines, (tips never reddish-brown). Cultivated form. Mammillaria bombycina f. flavispina hort. : Has evenly creamy-yellow or yellow hooked central spines, (tips never reddish-brown). Cultivated form. Mammillaria bombycina f. monstruosa green clone hort. : It is a strange monstrous cactus cultivar that forms very rubbery and squishy green and purple glob. Mammillaria bombycina f. monstruosa white clone hort. : It cluster aggressively and forms a gorgeous white mounds with a fluffy appearance. Mammillaria bombycina cv. Split Spine: This very rare cultivar has unique "Split spines". 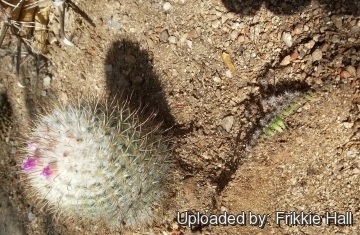 This is an exclusive feature never seen in other cacti. 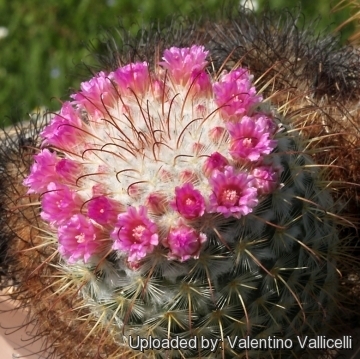 Mammillaria perezdelarosae Bravo & Scheinvar: Differs from Mammillaria bombycina in its darker centrals and denser, pectinately arranged radials that completely conceal the epidermis, and in its paler pink flowers. Mammillaria perezdelarosae f. cristata hort. : crested form with stems densely covered with glassy white radial spines with hooked dark-brown centrals. 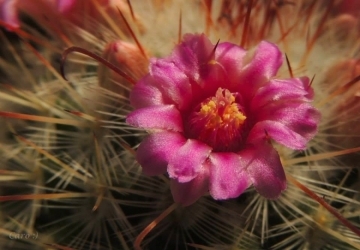 It is one of the more beautiful crested Mammillaria. 5) Fitz Maurice, B & Fitz Maurice, W.A. 2013. 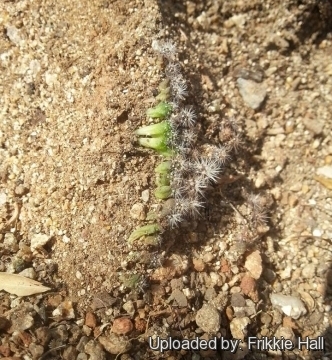 Mammillaria bombycina. In: IUCN 2013. "IUCN Red List of Threatened Species." Version 2013.2. <www.iucnredlist.org>. Downloaded on 20 February 2014. 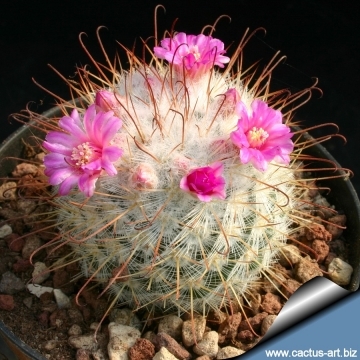 Cultivation and Propagation: This is one of the easier species to grow, it is an easy bloomer and don't requires any special treatment, it have consistently clean spination whether grown indoors or out but the plants are the most beautiful when cultivated in the full sun that encourage the heaviest spine formation. Regular water in summer. Keep dry in winter. Frost tolerance: 4° C.